Our second shot at a new energy future has arrived. But how can we transition to this sustainable future and can moving our money drive that shift? The hard reality is that the coal industry is not going down easy. With a projected $100 billion investment in new coal over the next 15 years, Australia is ground zero for the coal industry. While the renewable sector continues to expand, a series of backward ‘coal wars’ are unravelling across Australia – wars that are dividing communities, devastating ecosystems and fuelling dangerous climate change. The battlefields are places like Maules Creek in NSW’s Leard State Forest, where Whitehaven Coal, financed by our Big Four banks, is constructing Australia’s biggest new greenfields coal mine. It’s been forecast that the mine will destroy the largest single remnant of native vegetation in the Liverpool Plains forever, dump thousands of tonnes of coal dust on neighbouring communities, and unlock emissions equal to New Zealand’s entire energy sector. And there are places like the Galilee Basin in Queensland, where companies owned by billionaire mining barons Clive Palmer and Gina Rinehart are planning nine mega mines, which would turn the Great Barrier Reef into a coal shipping highway. It has been estimated that cumulative emissions from these mines would make the Galilee Basin the seventh largest emitter in the world, ahead of countries like Canada and the UK. Overseas, where most of this coal will end up, the battlegrounds continue. Recent analysis found that coal pollution in China was responsible for a quarter of a million premature deaths in 2011. Top diplomats have turned down postings to Beijing, and Chinese schools have erected giant domes to protect their students from smog. In response, the Chinese government is turning up the regulatory pressure on coal, including the introduction of a national coal consumption cap and trial carbon pricing schemes in major provinces. As these measures unfold, they could leave coal projects – like Maules Creek and the Galilee Basin – stranded, without a market. Moves like China’s are not isolated. Increasingly, industrialised economies are taking action to curb their emissions and putting coal in the firing line too. At the time of writing, 60 carbon trading schemes are in place worldwide. When combined with the rising competitiveness of renewable energy, global measures to decarbonise the economy are prompting widespread predictions from experts such as Warren Buffet, WA Premier Colin Barnett and analysts from Bernstein, Deutsche, Citi, and Goldman Sachs, that coal faces an ongoing and permanent structural decline. The question is, will this decline be fast enough to avoid runaway climate change, yet smooth enough to ensure a just transition away from coal? For governments and investors serious about creating long-term, sustainable wealth, these two questions should be at the fore. Sadly, in Australia they are often drowned out by the political and financial noise of the coal lobby. But as Australia’s fossil fuel wars heat up, a groundswell of individuals and institutions are putting these vital questions front and centre. And one of the most powerful tools this movement wields is divestment. The divestment strategy is simple. Fossil fuel companies currently plan to burn five times more carbon than the climate can safely handle. To win, we’ll have to rein in that plan. The massive financial power of Australia’s coal lobby has proven that governments aren’t about to help with this task, so how do we break the deadlock? We divest. By publicly moving our money out of coal, oil and gas companies, we help to erode the industry’s social license to freely pollute the planet, in turn unlocking the political deadlock on climate action. The beauty of divestment is that we can all take part. If you have superannuation or a bank account, chances are it’s being used to fund coal. Market Forces estimates that since 2008, Australia’s Big four banks have loaned almost $19 billion to coal and gas projects in Australia. What’s more, at the time of writing there isn’t a superannuation fund in Australia that doesn’t have at least some exposure to fossil fuels, either directly or indirectly. Our public institutions are entangled as well, through university fund managers, council banking arrangements, and religious investment portfolios. But being entangled means we’re also in a position to drive change, by putting our money where our mouth is. And we can make the shift without hurting our hip-pockets. Analysis by global fund manager Aperio Group has found that removing fossil fuel companies from investment portfolios has negligible impacts upon returns and may even generate better returns. Fortunately, we don’t need everyone to drive the change. In fact, if the global pension sector were to increase its investment in low-carbon sectors by a mere 3%, then around $3 trillion would be leveraged for climate solutions – enough to tip the sector into the game-changing phase. And the divestment movement is growing fast. Having been kicked off by climate organization 350.org in early 2012, an Oxford University study has shown that the carbon divestment campaign is growing faster than any previous divestment campaign. Active in North America, Europe, Australia and New Zealand, over 400 divestment campaigns are underway on campuses worldwide, with divestment commitments secured from 9 universities, 20 religious organisations and 22 city governments, including San Francisco and Seattle. 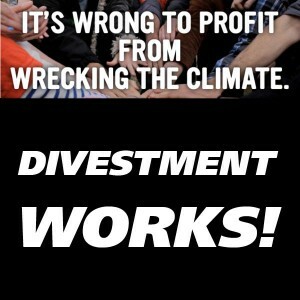 But divestment is also leaving an impression beyond the typically “climate concerned”. Major fund managers are creating fossil free options. Norway’s largest insurance company Storebrand recently sold 19% of its coal and gas stocks. The world’s largest sovereign wealth fund has halved its coal exposure. The World Bank, the European Investment bank, and the US Import-Export Bank, have all committed to not invest in new coal. Even President Obama, the International Energy Agency, and a suite of other conservative authorities have recommended divestment as a tool for tackling climate change. Needless to say, it seems we may be onto something. As the world wakes up to the impacts of coal, a growing movement of individuals and institutions is moving money away from the “land of coal floating on a sea of gas”. Instead, they are celebrating the endless possibilities that our renewable resources have to offer. The signs of change are already evident. Be part of something historic; join the movement today. Get involved in a divestment campaign at gofossilfree.org/australia. Or get support with moving to a fossil free super fund or bank at fossilfree.com.au. This post was written jointly by Charlotte Wood and Isaac Astill. This entry was posted in Activism, Climate change, Economics, Environment, Renewable Energy and tagged 350.org, activism, climate change, divestment, environment, fossil free, renewable energy, solar power by Charlotte Wood. Bookmark the permalink. This is such a well written article making the subject so accessible. Few movements around climate change give us real hope for turning around the Titanic before it tanks the planet. Fossil fuel divestment appears to offer a chance! And what a relief to find there are powerful actions ordinary people can take! My thanks to these wonderful young authors for this well written article & for helping me understand more on this important subject. this is brilliant, charlotte wood ….my question to you is: what can ordinary people like myself DO to speed up this process?….